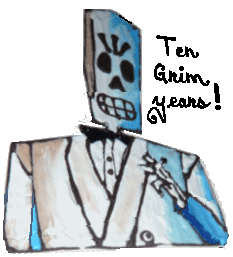 As of this October, Grim Fandango is 10 years old! On October 28, 1998, LucasArts' first 3D adventure game was released. Grim Fandango was their most ambitious adventure game project to date, spanning 4 game years over 2 CDs. Tim Schafer got together with most of the Grim team to celebrate the occasion with a cake adjorned with the game's protaganist, Manny Calavara. Congrats to the Grim Team! It's hard to believe it's been 10 years.